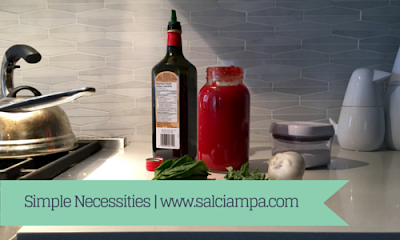 This is probably one of my most favorite recipes, basic tomato sauce. Once again, going on the premise of a simple home made meal (apart from your store bought pasta), this recipe takes a few basic ingredients and makes a wonderful sauce for your pasta. This may differ from most other sauces because it's simmered for at least 2 hours. I know what you're thinking..."2 hours?! I can whip up a sauce in 20 min!!". But hey, the simmer just makes it taste good. Another key tip to this sauce..user FRESH herbs! Don't use those dried packages of oak leaves, buy FRESH basil and oregano. Apologies in advance for not noting exact quantities; but don't worry, you'll be fine. Oh..and don't use CANNED crushed tomatoes, I'm warning you from now. Pour some olive oil in your pot; enough to coat the bottom of the pot and then some. Heat on med low heat. Bring the sauce to a boil then reduce to a simmer for at least 2 hours.